The name of this project cannot be disclosed. This is a prototype I developed for a lead designer at a large game studio. The application interacts with an API to create and exchange gifts of any type among friends on Facebook and other social networking sites. 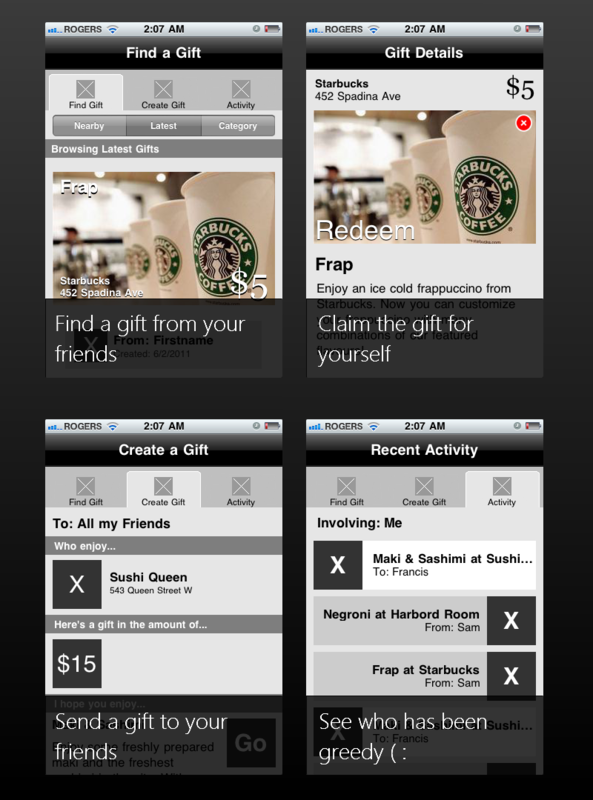 The purpose of the application is to make gifting social. We've all given a friend a gift certificate, but imagine gifting one of your friends on facebook a frappuccino and having them come meet you to pick it up. Not only would you get to hang out with your friend, your other friends will see where you are and that you just bought someone a drink! This view allows the user to see gifting activity. In this instance, Sam and Francis have been gifting each other quite a bit. Changing the involving filter will allow you to see gift activity between different individuals and groups. The application isn't available for download, but some screenshots have been made available below.